From the streets of Harlem to the Oval Office, General Colin Powell has met the challenges of leadership at every stage of his remarkable life. Today, he is one of the most admired public leaders in the world. 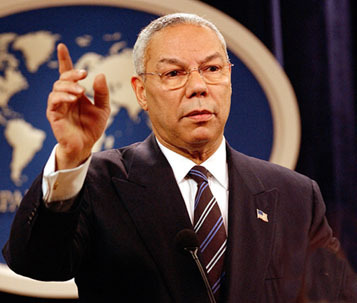 Colin Powell was the U.S. Secretary of State from 2001 to 2005 under President George W. Bush. Prior to that, he served as Chairman of the Joint Chiefs of Staff from 1989 to 1993, during which he oversaw the invasion of Panama and Operation Desert Storm. In 1997, Powell founded America’s Promise — The Alliance for Youth to improve the lives of children from all socioeconomic backgrounds. The author of the best-selling memoir, My American Journey, Powell speaks regularly on his improbable career arc and the leadership lessons he has learned along the way. Leaders should promote a clash of ideas. What’s the point of having people work for you if they can’t produce a clash of ideas. Powell wants subordinates to argue with him. Clash with the boss. There will come a point when the decision is made by the leader and no more clash of ideas and now execute it with passion. The leader has lots of realities to balance in on the decision. Create a noisy system. Argue and challenge. People realize that he wants what you know. Plans don’t accomplish work; only people get things done. Put the people who implement in the best situation possible to succeed. Commander come up with 1/3 of plan and leave 2/3’s for the commanders on the field. Asked some people on the frontlines to have direct line to him to tell him what’s really working and not working. Let subordinates not to feel threatened by people who talk directly to him. Go back to the person on the frontlines after they you’ve implemented something they brought to your attention. Reward your best performers; get rid of non-performers. Hard to do, but prune the organization because the good performers know it and become discouraged. Re-train, re-assign or fire. Be prepared to disappoint and anger people. You can be liked and be effective if you check your ego at the door. Check your ego at the door. If your idea isn’t implemented, don’t take it personally. The leader needs people like this. Make sure you have fun along the way. Having some fun settles the mind. Loves working on cars because come to the end with a solution. Beginning and ending, unlike so much of the other things he does. “People call me the black Secretary of State. I look around and say, ‘Is there a white one somewhere?’” He came into the army during the big integration push and told he would be measured only by performance. He never forgot that if he’d come in five years earlier, he wouldn’t have made it to chairman. But many who went before chose to serve even though the opportunity wasn’t there with the hope that some day it would be different. “I am first and foremost a product of my family and community.” Expectations and shame. We didn’t go through all we went through so that you’d do nothing with your life. You don’t want to go to college? Doesn’t matter, you’re going anyway. You’re of this family. Don’t shame us. Never got beat, just told he shamed the family. Would have preferred a beating. Perpetual optimism is a force multiplier. On the field, always looking for force multipliers. Optimism is infectious. When the leader starts to see the way through, it’s infectious. Can’t be spinning. Has to be real. Things always look better in the morning. Get a good nights rest and start the next day optimistically. Every morning had staff meeting and asked what is going on, something I need to know. Half-hour every morning. Looked into the eye of each persona and see how they’re doing. Leader then projects confidence. The essence of all interpersonal interaction between leaders and followers is trust by giving clear goals, inspired them, acted unselfishly and with integrity. On the actual battlefield everything is compressed but have to use the same process of analysis. “No plan survives contact with the enemy.” The enemy has also been planning and analyzing your strengths and weaknesses. Takes good thinking and great instincts. Someone rushes in with news of cataclysmic event and have to make a judgment call whether could be or not. Leadership is lonely. Powell would call Norm S. every day just to talk to him, so they would have someone for a few minutes and not be so alone. Became the only guy they could blow off to. Pastors need this because of having to keep so many confidences. The church should take the lead on social issues. Responsibility to educate and bring along young people without becoming politicized or partisan. Obligation to go out into the highways and by-ways. Has to go beyond their own wealthy environment and go to those who are poor and needy. Focusing on youth work. That’s what he’s done for 35 years. He wants to make “soldiers” out them—to have expectations, sense of shame… Has been matching is affluent church kids with poorer kids. What saves kids is someone coming alongside a hurting kid and telling them you won’t let their life be wasted. All of us have a debt of service we can't completely pay. Make a living, but give back.